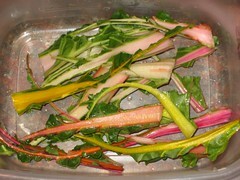 How do you say "and chard too" in Italian? 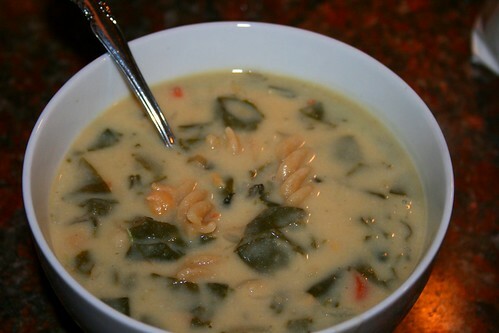 Because this pasta-and-bean soup also has chard. It was growing in my yard, begging to be eaten, so I threw it in. You could probably omit the chard and be fine. You could probably also substitute spinach or kale and be fine. 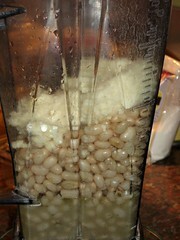 NB: If the bean mixture is too thick for your blender or food processor to handle, you can thin it out with some of the 4 cups of water that are called for in a later step. and remove the stems. Set the stems aside. 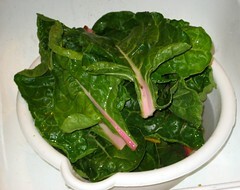 Chop the chard finely. 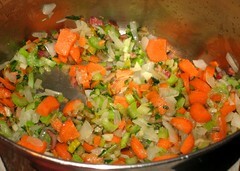 and saute for five minutes, until soft. to taste. 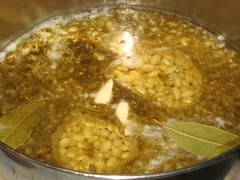 Simmer for another 10 minutes. according to the directions given on the package. Drain pasta and set aside. NB: This is a great opportunity to try whole-wheat pasta, if you're curious but have been afraid. 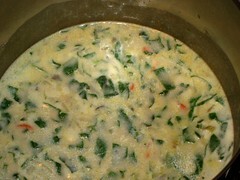 When the soup is done, stir in the cooked pasta and serve. Verdict: I absolutely love this. You could probably experiment with adding more okara, if you wanted to. 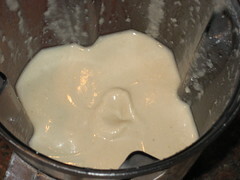 I played it a little safe and only added 5 ounces, which is a little more than half a cup.